Planning a bathroom remodel? 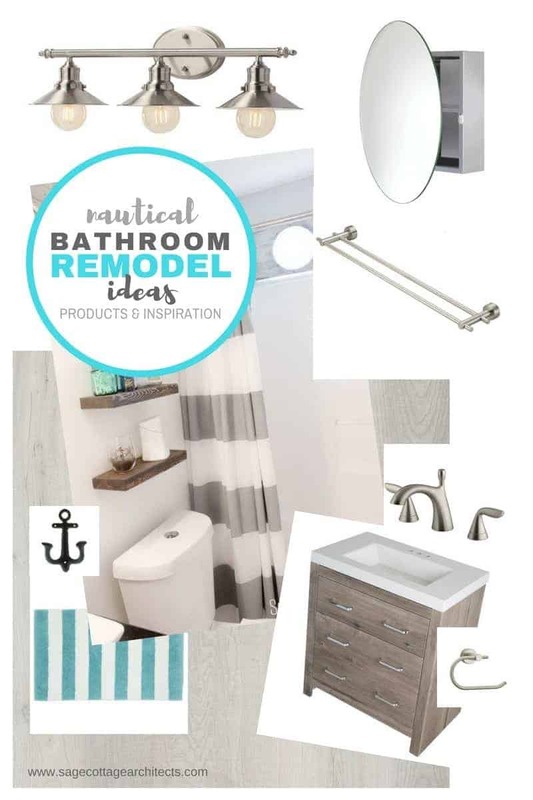 Get some nautical bathroom ideas and join me as I explore the planning process to remodel my small bathroom on a budget. I have a really small bathroom off my master bedroom. The floor area from wall to wall is less than 25 square feet. There is a shower that isn’t included in that size, but a 5’x5′ space with a toilet and a sink / vanity in it is a pretty tight squeeze. Making the bathroom larger isn’t an option, but it is possible to make it feel bright and airy with the right design decisions. In my search for design inspiration, I discovered this design for a bathroom with a nautical theme and I really felt like it captured the spirit of what I need for my bathroom. That design was done with a dual purpose, part of which is for guests. My design needs to take into account the fact that we don’t plan on living in our home forever. We have an 8-year plan, and plan to sell within or around that time period. So my nautical bathroom ideas need to keep in mind that the design needs to be flexible enough to appeal to future prospective buyers. But still achieve the look I want to live with for the next 8 years or so. While on a budget. When I add up the current prices of all of these items, it comes to around $1,175 (including a $50 budget for paint), not too shabby for a bathroom makeover. I think we can keep our current shower stall and though we probably can keep our current toilet, I love the concealed trapway on that American Standard toilet. It’s such a small bathroom, cleaning the toilet requires contortionist skills, so this should make that job easier. I also didn’t take into account new trim, a new exhaust fan cover and new outlets and light switches. We will be doing the makeover ourselves so we won’t have any labor costs. I’m sure there will be some unforseen issues that arise but my goal is to keep this bathroom renovation under $1,500. The closer I can get to $1,000 the better. I may also decide to replace the bathroom door if I can come in under budget. In order to reduce costs, I will be looking for alternatives to the products I selected, these were just examples of the style I like, I’m sure I can work towards finding some more budget friendly but quality items that will still achieve the overall look I am going for. We have three bathrooms in our home and all of them need some TLC, so I’m really trying to balance style and quality while maintaining a budget-friendly cost. Especially because we don’t plan on living here forever. Obviously Home Depot and Target aren’t the only places you can shop for items for nautical bathroom ideas. In addition to chain home improvement stores, many places have outlet stores where you can find great bargains. In the Chicago area, HOBO is a great source for home owner bargains from furniture and decor to flooring and cabinets and everything in between. No matter what style bathroom remodel you are considering, I highly recommend making your own idea board that captures the look and style you like. Then take it with you while you shop for deals and bargains so you can come in under budget but still end up with your dream bathroom. Stay tuned for future articles where I will show you my before pictures of my bathrooms, showcase the final products I select for my renovation, illustrate progress photos and we complete the job ourselves, and finally show off the finished product. And, of course, give you a final budget tally. Very nice!! Kind of beach-y and nautical. Love the flooring!